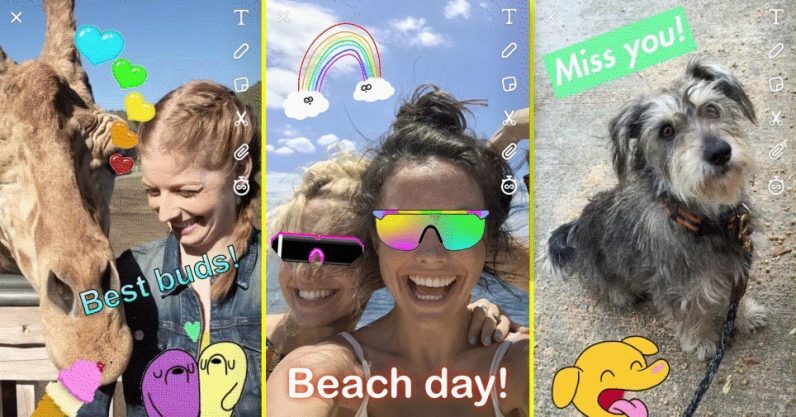 Snapchat today announced it was bringing a few new features to its app, including gif stickers courtesy of GIPHY. Because social media is a tawdry pile of copied homework, it shouldn’t come as a surprise that Snapchat is finally doing unto others what has been done unto it — Instagram just introduced this exact feature last month. In order to use the feature, select the sticker icon from the Snap editing screen — check our guide if you need a primer on how that works. Then tap search to bring up a list of stickers from GIPHY. They function just like stationary stickers, down to the ability to stick them to moving objects in videos — a feature which you might recognize from the GIPHY World ARKit app from last year. Like I said: copied homework. Another update coming to the app is a tab feature which groups Friend stories, Discover, and Group Chats into separate tabs. We’ve contacted Snapchat for clarity about whether this is something users can customize for their own convenience or just a new sorting system. Presumably this is part of Snapchat’s attempt to simplify its notoriously user-unfriendly app, as CEO Evan Spiegel promised to do last year. The redesign is already off to a rocky start, with users across the board decrying the confusing update and pleading for a chance to roll back to a previous version. The app’s ratings have tanked on the App Store, with recent negative reviews both there and on Google Play mentioning the update specifically. GIPHY stickers are available now on Snapchat, while tabs will be rolling out to iOS and Android in the next few weeks.